Women central to the fight for suffrage (and other rights for women) are are celebrated in this memorial located on The Reserve, corner of Oxford Terrace and Worcester Boulevard in Christchurch. 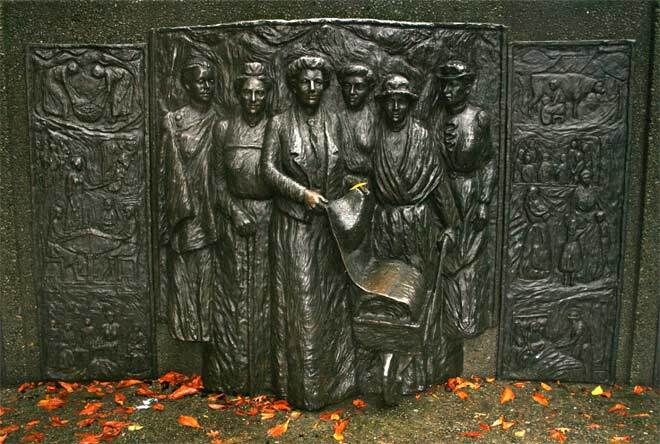 Kate Sheppard, leader of the campaign, is shown at the forefront of the the group, which includes Meri Te Tai Mangakāhia, Amey Daldy, Ada Wells, Harriet Morison and Helen Nicol. Te Tai Mangakāhia was the first women to address Te Paremata (the Māori parliament), when she argued for Māori women's right to vote (and stand for election) there. Daldy was president of the Women's Franchise League in Auckland and Wells was the organiser of the national movement. Morison, a union leader, vigorously supported the campaign and encouraged the involvement of women in the tailoresses' unions. Nicol led the fight in Dunedin.